Eating out these days is expensive and finding a restaurant that offers genuine value for money is no easy task. However, a Sunday evening visit to Coconut Grove at the Liberty Midlands Mall in Pietermaritzburg proved that dining out can still be affordable and enjoyable at the same time. Starters included offerings such as calamari, garlic rolls, mussels, prawns, escargot, mushrooms and chicken and French salad and although the line-up was tempting to say the least we all decided to proceed straight to the main course. The restaurant’s main menu has, to put it simply, something for everyone. Seafood dishes include the grilled crayfish and prawn combo, the platter with a choice of rice, French fries or vegetables, prawn curry, chicken and prawn curry, large grilled prawns, fried kingklip, grilled sole and southern fried prawns to name but a few. For those who prefer meat to fish, a selection of ribs, grills and steaks are available with the lamb spare ribs being highly recommended. Roast dishes come in the guise of beef, lamb, chicken, chicken peri-peri and southern fried chicken while the combo platter is a house favourite. 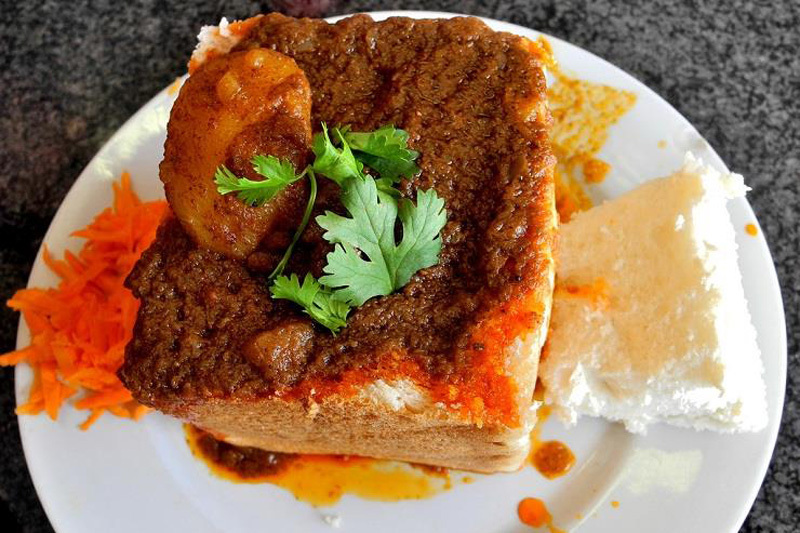 South Africans, particularly in this part of the world, love spicy food and Coconut Grove doesn’t disappoint by offering all the usual choice of curried dishes with the curry platter for two (R120), being the most popular. Dedicated non-flesh eaters have the option of a vegetarian lasagne or a tasty helping of breyani while old favourites like fish and chips, chicken a la king and pie, chips and gravy are also available. For the not so hungry a wide variety of schwarmas, roti rolls and burgers find their way onto the menu while those with a sweet tooth can indulge in a decadent choice of desserts too numerous to mention. I didn’t take very long to make my choice, opting for the fish and chips (R39.95), which included a French salad, cole slaw, and a helping of potato salad. The dish was tasty and the helpings more than generous and one would be hard pressed to find a better deal in any restaurant anywhere. Not being great seafood fans, dedicated meat eaters Tanya and Mary-Anne opted for the steak burger with chips (R35) and steak schwarma with chips (R39.50) respectively. Both ladies enjoyed their meals although Tanya did remark that her burger was a bit on the spicy side. Full stomachs forced us to pass up on dessert although if we had just an inch of space to spare we could have made room for a serving of ice cream or two. Coconut Grove is definitely well worth a visit for families, couples or anyone looking to enjoy an affordable and tasty meal in a relaxed and pleasant environment. The staff were friendly and helpful, the menu variety excellent and the food tasty and well presented – a winning combination in anyone’s books. We had lunch at this restaurant yesterday. The mutton curry consisted of 90% bones and the little meat that was on was terribly hard. The dishes were all chipped and the cutlery was made from tin. I was disappointed with the standard of the food and service. Why do Indian restaurants compromise on standards to make a quick buck? I noticed a similar feat with the Brittania Restaurant in Durban. I will in future use franchise restaurants when eating out and leave Indian Cuisine up to my wife to cook. Would love if you could have your menu on your website as well, like all the other eating places. especially for us out of town people. when looking for a place to eat, no one wants to go from place to place to ask if they could look at their menu.